There seems to be no definitive answer as to the origin of the name Corralitos. Translated from Spanish it means two or more small yards or enclosures, or little corrals. Its origin has thought to be during the time of the Portola Expedition in 1769. This was the first written history of this area and many of today's place names originated at that time. It may have been at a later time that this term actually came into use. By 1810, the name was said to have been in common usage. In April 1823, it was the name given a land grant rancho, Rancho de Los Corralitos. In the mid 1850s, a northerly portion of this rancho land was the location where the small town of Corralitos was established. The rancho property was an area of four square leagues, 15,440 acres in size including a much larger area than the town of Corralitos. The following information includes the various thoughts on the origin of the name Corralitos that have been written in local history books and research materials. Any additional information that anyone could add would be very much appreciated. Please write to judy@corralitoshistory.com or fax to (831) 724-4766. In October of 1769, the Portola Expedition crossed over and camped on land that years later would be known as Rancho de Los Corralitos. The party consisted of 64 persons including the following: Gaspar de Portola (commander) and servant; Captain Fernando Rivera and servant; Lt. Pedro Fages and 6 or 7 Catalonian volunteers; Miguel Costanso, military engineer and cartographer; Sgt. Don Jose de Ortega and 26 or 27 cuera (leather- jacket) soldiers; 15 Christian Indians from Baja California; 7 muleteers; Father Juan Crespi and Father Francisco Gomez. Their food, baggage, and equipment required thirty pack mules together with the horses they rode and extra mounts. On Wednesday, October 11, the group stopped to camp near a small lake with the land about it covered in pasture and many trees of redwood. This campsite was by what appeared to be a small separate lake, but was actually part of a larger lake being connected by a narrow strait. 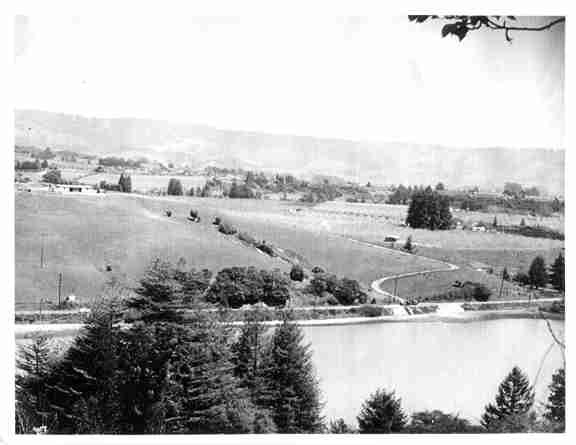 This larger lake was present day College Lake, which is near Highway 152. Some Santa Cruz County researchers have thought the name Corralitos was derived from the name the Portola soldiers gave their campsite here. It was usual whenever the expedition stopped for the night to have herders watch the horses and mules while they fed at night. Here, too many men were sick and were unable to do this. They constructed a corral, part corral and part lake, to hold the stock on the inside with the men. The soldiers named the site, El Laguna del Corral. Father Crespi named the area The Lagoons and Chestnuts of Nuestra Senora del Pilar. (It was common for the friars to give holy names to the sites while the soldiers named the sites for incidents that happened there.) In 1774, the Don Juan Bautista de Anza Expedition returned to Monterey by way of Portola's route. 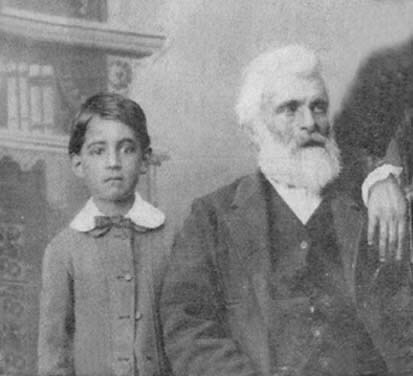 Father Francisco Palou and Captain F. Rivera, who were familiar with the Portola route and campsites, accompanied the expedition. Palou wrote of the campsite, El Corral, in his diary. Question for the reader: Why would the name meaning two or more small enclosures be derived from this one larger corral? Some historians and researchers have believed that Corralitos referred to corrals or enclosures in which the Santa Cruz mission kept their flocks and herds on Corralitos land. 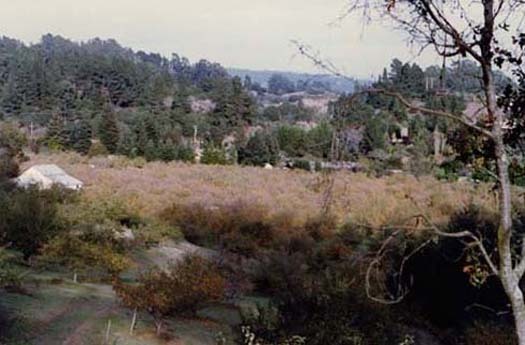 Santa Cruz mission missionaries and the Branciforte villenos were in competition for the Corralitos and Salsipuedes pasture land when theirs became overcrowded. In 1803, Marcelino Bravo, one of the villenos, petitioned for permission to move a number of people to Corralitos. In a second petition, Bravo complained that the numbers of livestock had grown to the point that the pastureland was overcrowded and his cattle were falling into the ocean and into mountain ravines. The site was not being farmed, but had arable land and water. Bravo's petition was denied by the Mexican government that argued that a dangerous precedent would be established by allowing settlers to move from a government sponsored community (Branciforte). After 1803, several of the villenos began an unsuccessful attempt to move to Corralitos. In 1807, and prior, the presidio in Monterey pastured 500 horses on Salsipuedes and Corralitos land. Questions for the reader: Were the names Corralitos and Salsipuedes actually being used in documents in 1803? Did the Santa Cruz mission ever keep herds or flocks on Corralitos land? Did the Monterey Presidio first refer to this area as Corralitos? 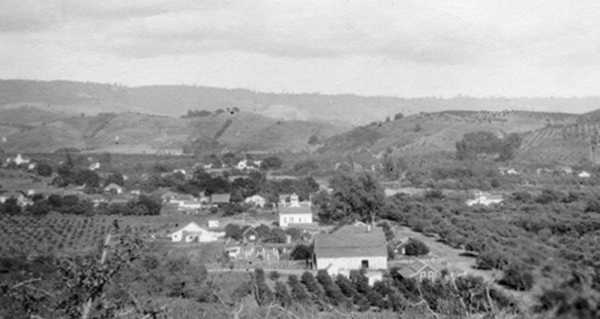 There are still residents here today who think the name was in reference to the fact that Corralitos is in a little valley nearly surrounded by foothills of the Santa Cruz Mountain range thus the name "Little Corrals". Author's note: The name was used, however, for the entire rancho land before it was used for only the town. 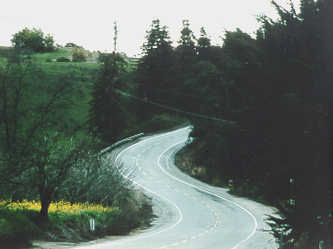 In anecdotes in E. S. Harrison's 1892 history of Santa Cruz County, it is stated that the name Corralitos was in reference to the rings that redwood trees form: "Corralitos is the name of another river and small valley in this end of the county, and literally signifies a number of small enclosures. 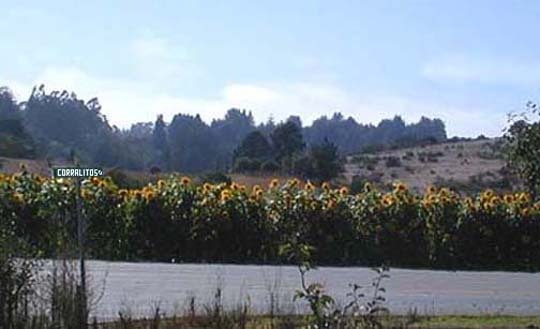 It is a few miles north of Watsonville, and in early days a part of this valley was covered with redwood trees. These trees grow in clusters of five or six or more, but in this valley in a number of places they grew in a sort of circle, something like the palisades of a stockade, leaving a bare or grassy spot between them of from twenty to two or three hundred feet in diameter. It was these places that suggested little corrals and caused the place to be named Corralitos." 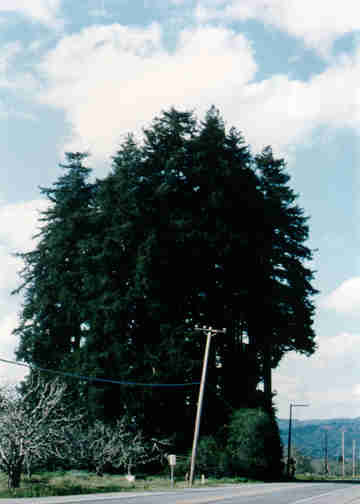 As a redwood tree grows, its base thickens and enlarges, forming a bulbous "root burl". This mass is capable of producing sprouts, which utilize the parent tree's root system, creating a ring of smaller trees around the original tree. They are referred to by some people as "fairy rings." As the parent tree's life force is eventually depleted, possibly due to age, windstorm, drought or ground fire, the ring of smaller trees will continue to grow. In 1774, during the De Anza expedition, Palou's account tells of crossing the (Corralitos) valley and of one of the soldiers who rode into the heart of a burned out redwood, saying as he did so, "Now I have a home in case it rains." 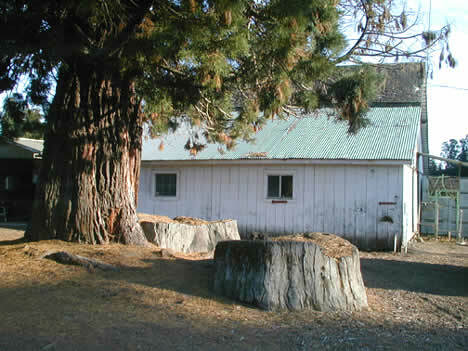 It was in the area of the campsite, El Corral, that Portola's Expedition first examined the redwood trees; thus the first written history about redwood trees or Palo Colorado as they called them. On Sunday, October 15, the group moved northwestward across rough hilly lands to a boxed-in creek, and across a valley filled with redwoods. 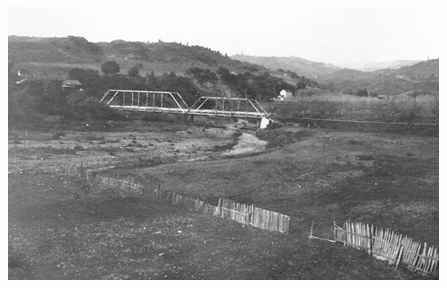 This was present-day Corralitos Creek and valley. 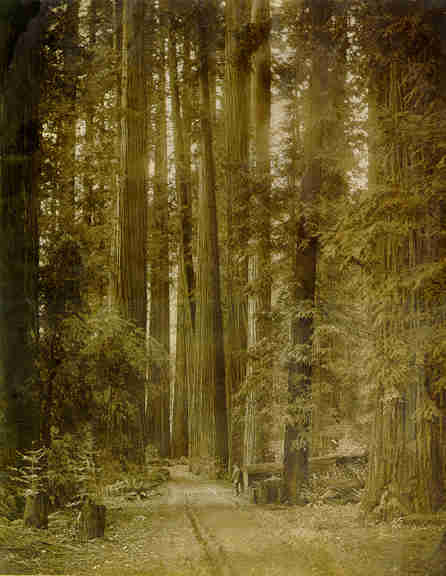 It was here Miguel Costanso marveled at the size and number of the redwood trees, stating that many of them measured from eleven to thirteen feet in diameter. Lt. Fages wrote," Here are trees of girth so great that eight men placed side by side with extended arms are unable to embrace them." Author's note: The thought that the name Corralitos was derived from the redwood fairy rings seems very appropriate and fitting for this area. Rancho de Los Corralitos was granted to Don Jose Amesti in 1827. He and his wife Prudenciana had a ranch named Palo Colorado not too far from Portola's El Corral. The redwood forest first referred to in expedition diaries was on his property. Eventually, the trees were cut and milled by manpower before sawmills and steam power became prevalent in the nearby mountains. 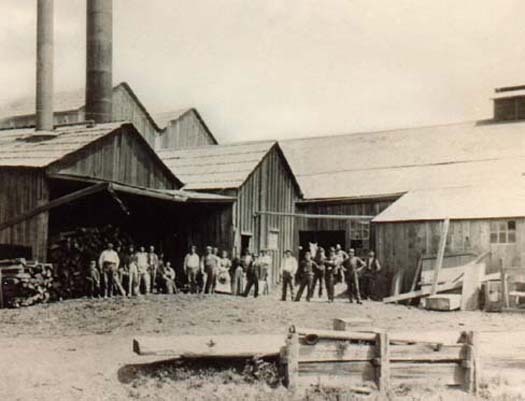 Amesti is said to have had a whipsaw lumber mill in 1832 on the upper Corralitos. He allowed others to cut on his rancho, as well, including Juan Bautista Cooper, Thomas Larkin and Don Ignacio Coronel. The area was clear cut and stumps eventually removed, but for a few isolated stands of redwoods. A beautiful stand of coast redwoods (Sequoia Sempervirens) from this forest that once covered the valley of Corralitos is located on Corralitos Road near Varni Road. They stand very near to where the Portola Expedition passed. They are second growth redwoods said to have been about five or six feet tall in 1878. They are also a landmark for the site of the oldest of the county's rural schools, Oak Grove. The schoolhouse was once located across the road from them. So far, the various owners of that property over the years have let this stand of trees remain. The trees mark the entrance to Corralitos and many residents have an emotional bond to them. Redwood forests still grow in the canyons and hills above Corralitos and timber harvesting continues today. It is common to see the large logging trucks loaded with cut trees pass through what was once itself a redwood forest. Today, near the Portola path. 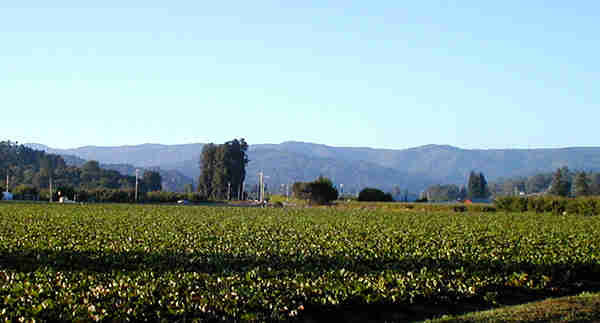 The stand of redwooods on Corralitos Road is near the center of the photo. This area was once a redwood forest. across from Chandler/Freedom Lake, 1950. 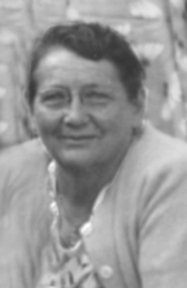 The information mentioned above is in tribute to Florence Richardson Wyckoff whose great passion for historical preservation and the redwoods (among her many other contributions) has made a great and lasting impression on our hearts and our community. Florence's wonderful philanthropic history is available on line at www.ucsc.edu/library/reg-hist/wyckoff.html. 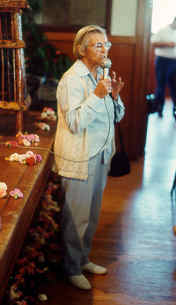 A memorial service in celebration of Florence's life (October 5, 1905-September 20, 2000) was held in Watsonville, Ca. on October 5, 2000. The custom of announcing a death by tolling the church bell is a very old one. Anyone within earshot would listen for twice three strokes for a woman and thrice-three strokes for a man, followed by a steady tolling of the years of the person's age. On October 5th, before the service, three strokes twice were rang; and, as Florence was in her 95th year at the time of her death, the bell was rung that number of steady strokes on the great bell at All Saints Episcopal Church. Click on the Photo at the right to get the full photo of Florence. Or just click here. October 18, 2005. 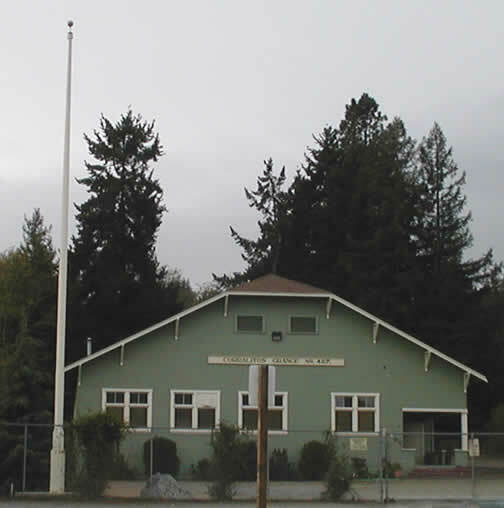 A flagpole dedication was held at the Corralitos Grange Hall. The dedication was in memory of Roy Bradley, Jim Pio and Marty Martin for their contributions to the preservation of our historic building. 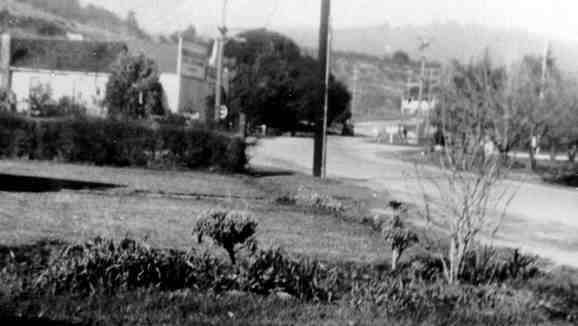 The Roses of Yesterday business on Brown's Valley Road was established by Francis E. Lester in the 1930s. He was originally a citrus grower from Riverside, CA. He lived at the house on the corner of Brown's Valley and Redwood Roads. It was there that he ran Lester's Rose Gardens. His catalogs were titled Roses of Yesterday and Today. Will Tillotson joined him in the business. After Lester's death, Mrs. Lester started a display garden and packing shed on the property across from Jensen's apple shed (410 Corralitos Road) with Tillotson and Dorothy Stemler. 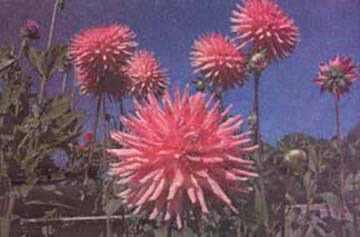 Tillotson owned the business himself from 1948 to1957 as Tillotson's Rose Gardens. He established his home and rose office at 802 Brown's Valley Road and used the packing shed on Corralitos Road for a time. 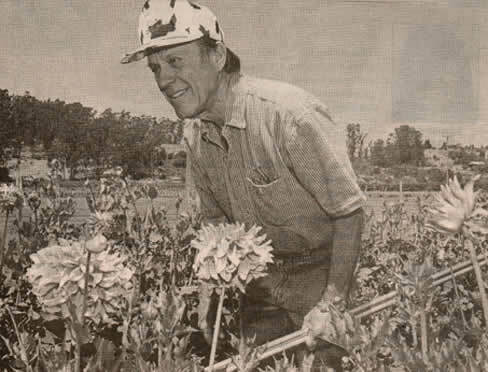 When Fred Hamisch owned the property at 410, he grew a few crops of the roses. Later the crop growing was moved to San Jose because roses could not be grown on the same piece of land without rotating the crops. It was necessary to grow alfalfa or cotton to replenish the land, so it was a constant effort to find land to propagate the roses. 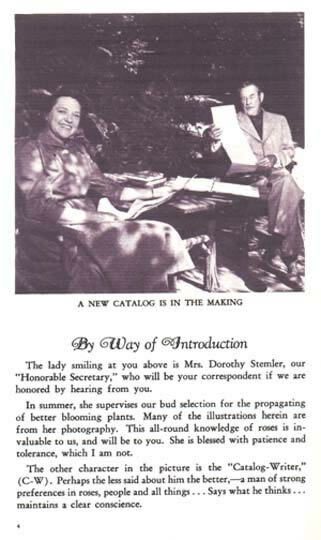 Dorothy Stemler became Tillotson's �Honorable Secretary� and together they collected, propagated and distributed many of the old roses at a time few were. They were a fine pair. They enjoyed correspondence and feedback from customers. They would incorporate this into the descriptions each year in the catalogs. 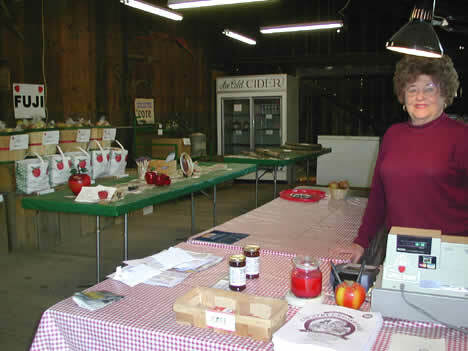 Dorothy became sole proprietor when Tillotson bequeathed the business to her in 1957. 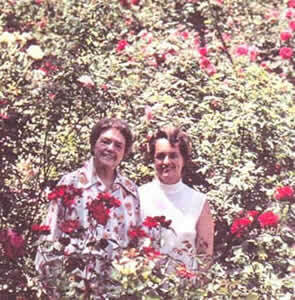 She ran the business until 1976 as Tillotson's Roses with the help of her daughter, Patricia Wiley. They officially changed the business name to Roses of Yesterday and Today in 1977. 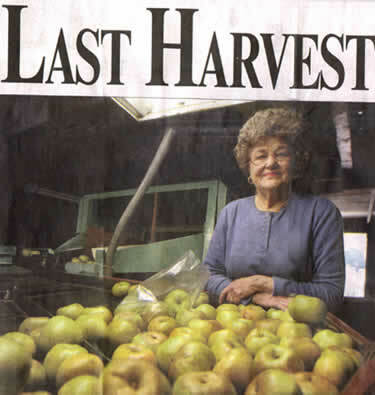 Patricia and her husband, Newton E. Wiley, grew the business even more from 1976 to1996. 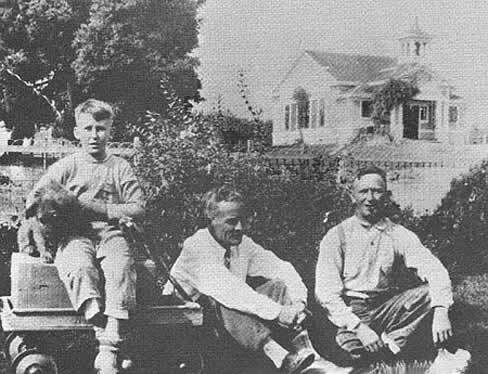 They established the garden at 803 Brown's Valley Road. They added a shed and expanded to encompass the 240 varieties of roses that are there now. When Pat and Newton retired, their elder children, Andy, Jack and wife, Guinivere, continued to keep the garden open to the public every day and offer potted and bareroot roses. In 1998, the rose business established an Internet site www.rosesofyesterday.com. Bob Gilardoni. 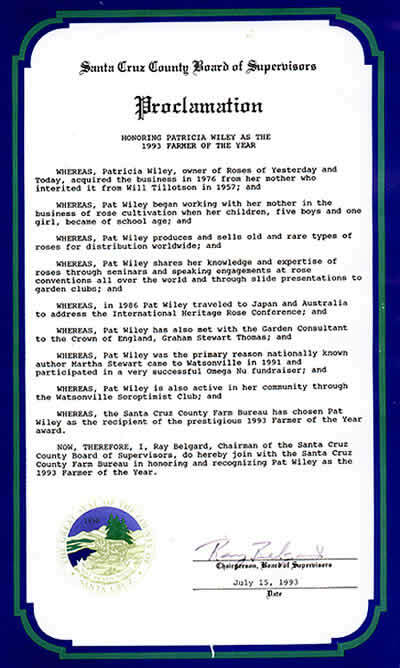 A pioneer in Central Coast organic farming. 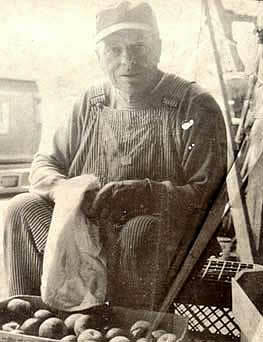 1931 Ed sitting on wagon. 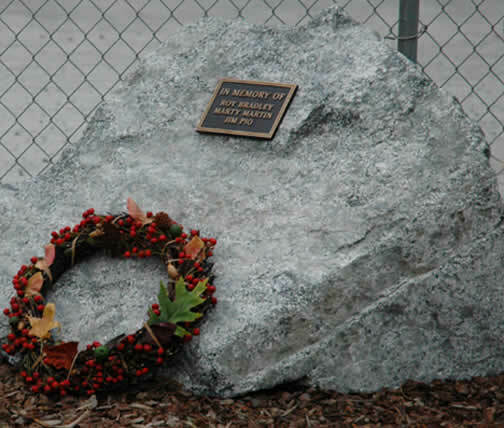 His father, George, served for about thirty years as a Pleasant Valley School trustee. 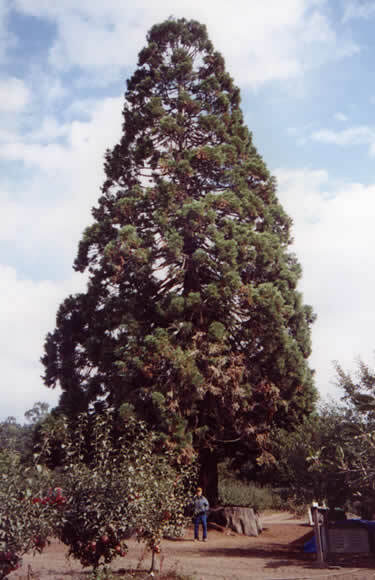 Ed planted this beautiful Sequoia when he was a teenager. It is next to coastal redwood stumps that are hundreds of years old. 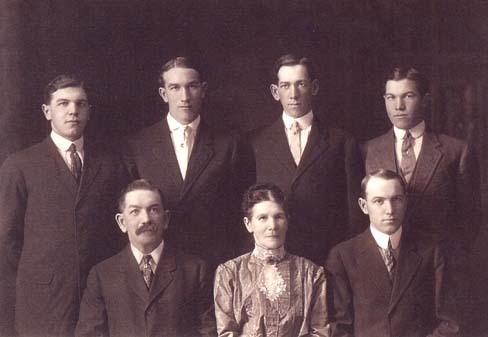 Three of Benjamin and Mary Carmen’s children were born in Corralitos between 1856 and 1866. They were Benjamin, George W. and Mary Carmen. 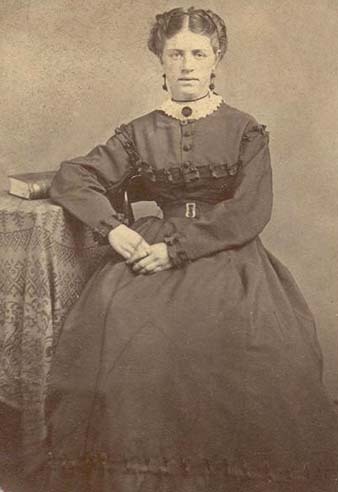 The eldest Hames daughter, Frances, born in 1847, married Levi Hunt of Corralitos, on September 30, 1864. 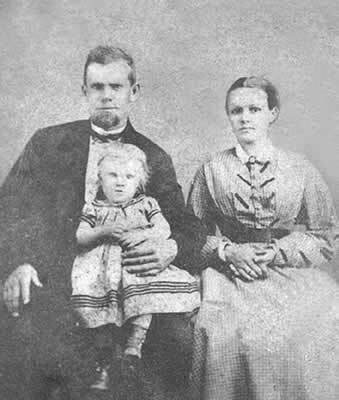 Levi had moved with his family (parents John and Julia Mylar Hunt) to California from Missouri in the spring of 1854. 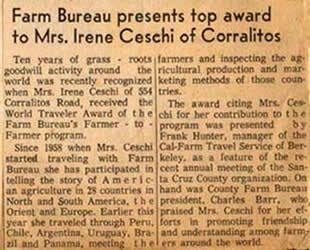 In June of 1865, he purchased two acres in Corralitos including where Corralitos Market is today. 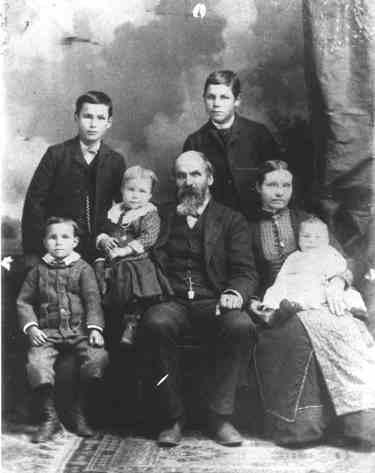 Frances Hames Hunt with her daughter Frances Price, also left to right Thomas, Johnnie, Cora, and son Frances Price. Child on right not identified. Levi’s sister Amelia (Amy) was married to George W. Post of Corralitos. She was born April 14, 1852 in Watsonville. 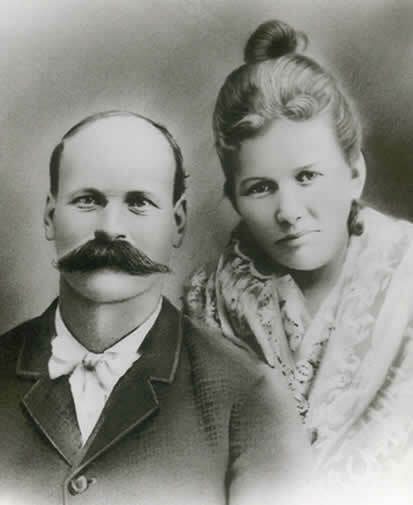 Levi’s sister, Elizabeth, married Robert Orton, who was originally from New York. In 1867, he was quit-claim deeded the flour mill in Corralitos that Benjamin Hames had once co-owned. 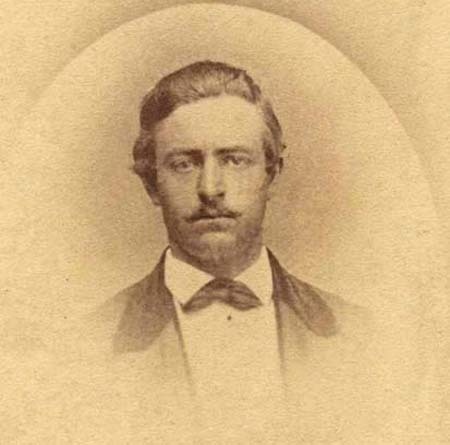 Robert was the Santa Cruz County Sheriff from 1871 to 1879. It was their son’s tombstone (Refer to page 161 in book) that was found in the Corralitos Creek over a hundred years later. 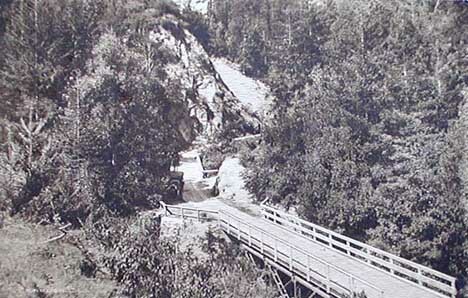 In 1891, a substantial bridge was built across the Corralitos Creek extending what was then Mill Street to reach the east bank. 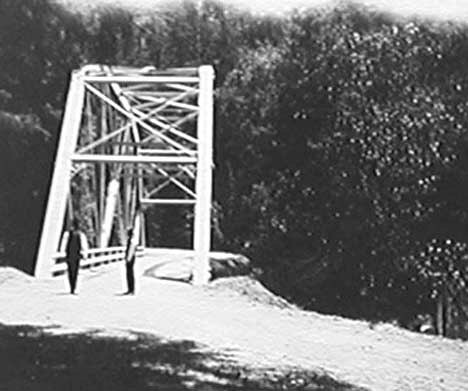 Prior to this, Mill Street crossed the creek south of the bridge from about where this photo was taken circa 1919. Aldridge Lane was named for Franklin Aldridge. Franklin was born April 20, 1826 in Louisville, Kentucky. He died in Corralitos on November 21, 1900. 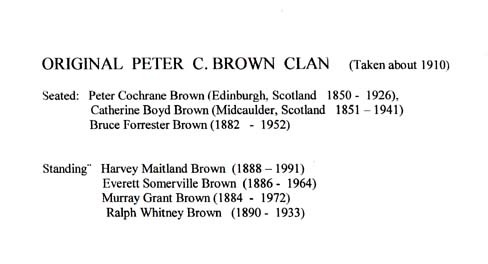 In 1871, he married his third wife, Anna Margaret Fallien. She was born in 1850 and died in Corralitos in 1919. 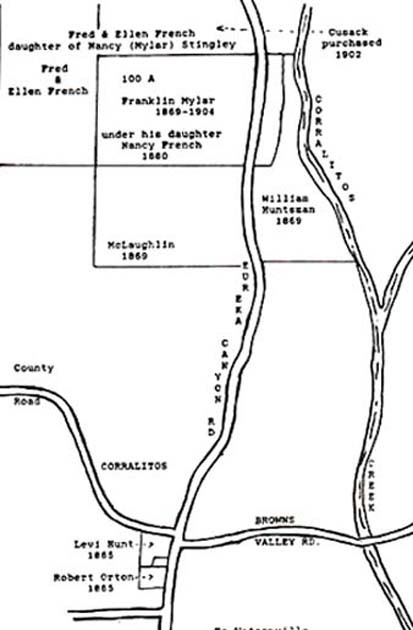 In 1875 Franklin Aldridge granted in a deed to Corralitos District School trustees John Bradshaw and Thomas Parker and their successors a parcel of land situated in the village of Corralitos. At that time on the property was the new two-story schoolhouse. The property was "to have and to hold so long as it shall be used exclusively for public school purposes, and when it shall cease to be used for said purposes to revert to the grantor his heirs or assigns." 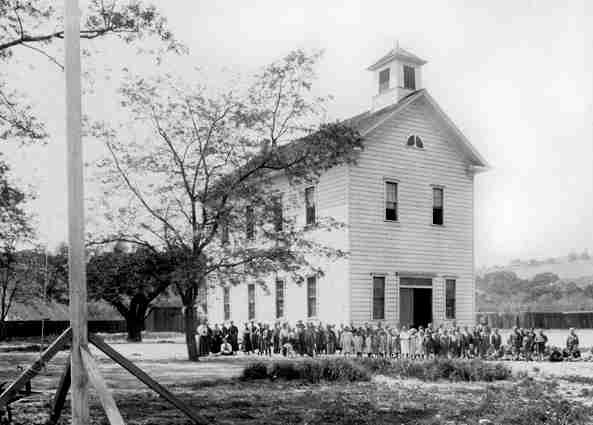 The 1906 earthquake damaged this two-story building making it necessary to build a new schoolhouse. By 1929, this second school building was described as a "crude affair." A larger modern schoolhouse was built and continued to be in use until fall of 1951 when the present day Elma G. Bradley School opened on Corralitos Road. Once the third schoolhouse was dismantled, the area became an open field. It had many informal uses over the years including baseball diamonds, a fenceless tennis court, basketball court, volleyball court, public parking and a horse corral. Eventually, as the population grew, the Corralitos community needed public park space and this property became considered for the development of a community park. With the help of the County and Anna Belle Aldridge Edwards, the Corralitos Valley Community Council (CVCC) undertook this project and formed Corralitos Valley Research and Education Association (CVREA) as a non-profit fund raising organization. Their first fundraiser was to match grant money that was available for parks, such as was desired for the Aldridge Lane property. In the tradition of the past, some industrious and community spirited families rallied the community into this project. Today Franklin Aldridge would be pleased to see the children at play in this lovely community park on what was once his property. Anna Belle Aldridge Edwards, granddaughter of Franklin and Anna, kept a wonderful account of the Aldridge family. She passed away in December 2001. Refer to Family Contacts on site map. 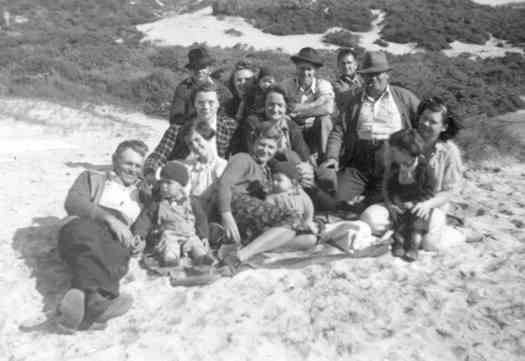 At the center of the photo, from left to right, are Ella Marie, Roberta and Ray Brodin with the Bud and Ruby Bradshaw family. My mother and her sister Jennie lived with an Aunt Olive in Seattle when Mother attended University of Washington and got her teaching credential. Her first school was at Bissell in eastern Washington. It was a one-room school and she taught all grades. Some of the boys were larger than Mother. They had to help with harvest and planting and were only able to go to school a few months a year. There was a wood stove and a bucket and ladle for water. There was a path to the outhouses. 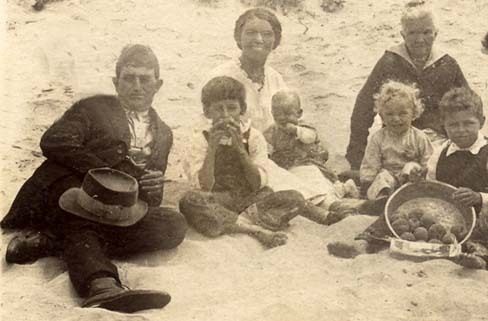 Mother boarded with a German family. She taught there for two years until she met my father. There were box socials and the women decorated their boxes and cooked the most delectable food. Mother was interested in a young German fellow and so she worked especially hard to make her box as attractive as possible. The men bid on the boxes and got to eat with the person whose box they won. Dad outbid everyone and won Mother's. He kept up the relationship for the rest of the school year. In the summer, Mother and Aunt Jennie went to the World's Fair in San Francisco and stayed with their parents. They had a ranch in the Jack London area. There were wonderful railroad lines then and Mother and Jennie rode the train everywhere. My father wrote to Mother every day while she was gone. When she got back to Washington, he proposed and they were married October 19, 1915. My father had a business degree from college in Coeur d'Alene, Idaho. In Washington, he had a store and post office near Davenport. The upstairs above the store was their living quarters and in the winter when it snowed they would get together and dance and have a great time. Dad played the violin and other men played instruments, too. Sometimes the snow would be so high that they were snowed in and had to spend the night. Dad bought a two-story home on a quarter section of land in eastern Washington and raised wheat. The depression hit Washington and he could not make a go of farming. He wrote to my grandparents and they tried to discourage him from moving, but he and Mother packed up their belongings and their three daughters and moved to California, anyhow. 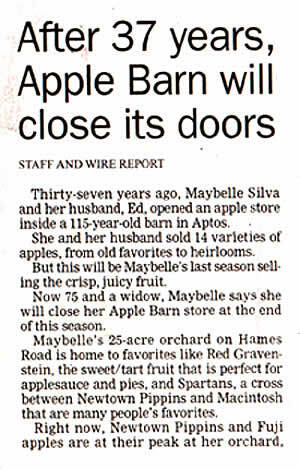 By then, my grandparents had moved to a ranch near Watsonville and we stayed with them. I went to first and second grade there. When we moved to Corralitos their fourth daughter was born. In the summer of 1926, Mother went to summer school in San Jose and got her California teaching credential. She got a position in Corralitos teaching third and fourth grade. We had to make up a district for the school, so we lived in a cabin up in Brown's Valley for a couple of years. Dad was working for Paul Momand and doing his books. He took the car to work and the rest of us walked a couple of miles down a trail to the bus stop. There were so many wild berries and wild flowers that it was an interesting walk and Mother knew the names of all the trees and flowers. It was like camping there because we had to haul water from the creek and use kerosene lamps, but all of the time we lived there none of us ever got sick or missed a day. There was poison oak and we did not get it, either. I was in Mrs. Munson's fifth grade because Mother did not want two of her daughters in her room at the same time. I skipped the fourth grade and did not know how to multiply or divide. My first report card had a red D and my father worked with me for the rest of the year to do story problems and everything else. When we were in Mrs. Munson's room she had us play in a harmonica band. We would go to San Francisco and play on KGO. It was in her room that we listened to the National Broadcasting Music Hour. They had quizzes and once they gave a five-dollar gold piece if we could identify all of the instruments correctly. I could not believe that I got them all right and won the gold piece. It was a prized possession of mine, but when we went off the gold standard in 1933 I had to turn it in. I bought my class ring with the money. When we were in Mrs. Bradley's seventh and eighth grades she took us to Sunnyvale to see the Macon dirigible and we got to go into the hangar where it was moored. It was such a wonderful experience. She also arranged for us to play basketball at Amesti and other schools. 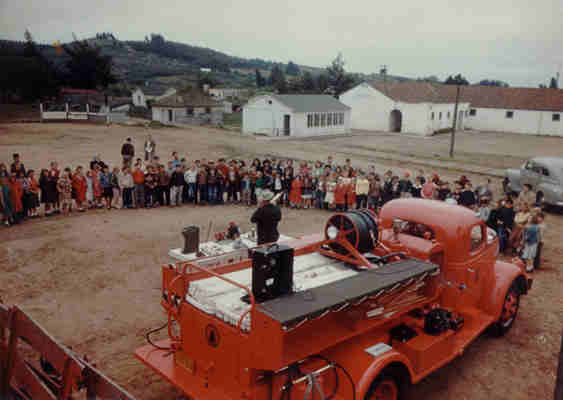 Each spring there was a playday at Soquel School and we went as a school and had all kinds of activities. When we were in the old school, the playground was divided and the girls were on one side and the boys on the other. By 1930 the new school was built, just before we graduated. 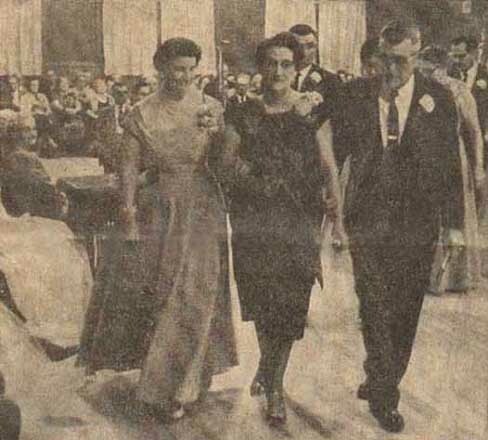 Our graduation exercises were held in the Ceschi hall and we dressed up in pretty clothes and received baskets of flowers. We belonged to 4-H club and the girls took sewing from Mrs. Ceschi. She was a stickler for perfection. We were not allowed to work on our project except at her place. 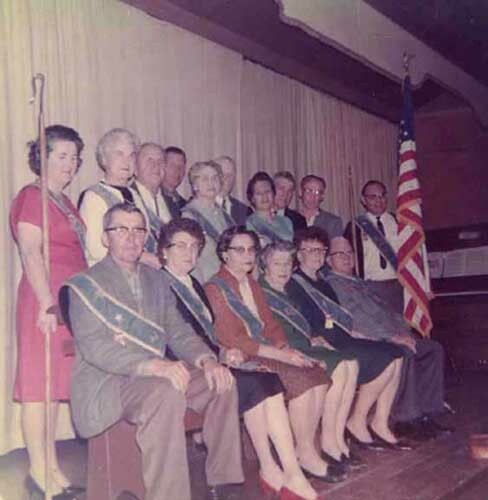 We learned to hem dish towels and when I got older I made a light green, lined, wool suit with bound button holes and was able to model it in Davis at our convention. We went to various places for our meetings. In the summertime, we picked berries and cut cots. Irene and Jim Work had a drying shed and we went each day and cut cots all day for 10 cents a box. I was never able to make more than a dollar, as we were not to slip pits, as that would make slabs of the fruit. When we got a box of Moorparks we were delighted as they were large and you could cut a box in no time, but we didn't get Moorparks too often. We went to 4-H camp at Camp Loma up near Loma Prieta. There we had crafts and swimming and hiking. We took turns working at the tables. It was great fun. I never wanted to go home. We did not have sleeping bags. We just dug a hole for our bottoms and put straw down and our blankets. In the morning we would put on our bathing suits which we had hung on bushes and went swimming before breakfast. regular evening service. It was very simple times when we were growing up. After we moved to the Rocco house across from Scott's store (now Corralitos Market), we girls would sit on the fence by the flume and wait for the boys to come by. There were Ed, Ray, and Elmer Pybrum, Elvin Bradley and others. When Ed got old enough to drive we would go all over the roads in Corralitos. One time we were on Hames and he kept going faster and faster and we were all yelling. An axle broke on the car and we all got out. We were not too far from home. I fell and skinned my knees. It seems I had skinned knees most of the time. Mother used to say I would probably have skinned knees when I got married. My father and all of the men in Corralitos worked to build the Grange Hall and each of the men took turns at being master. My dad was the second master. We had some wonderful times in that hall. I did not belong to Grange as I was a Rainbow Girl and our meetings were the same night. 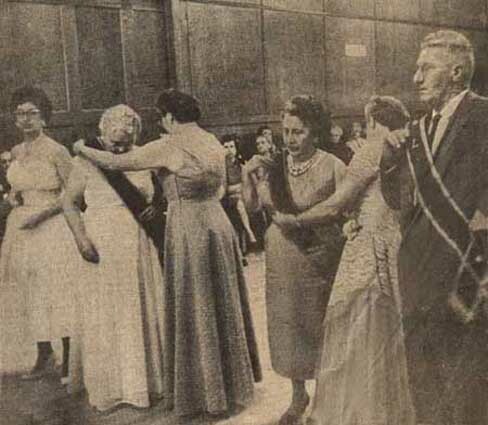 My mother and sisters were in the drill team and held various offices through the years. It was such fun living and growing up in Corralitos. Everyone knew everyone and we did all kinds of things together. Before I was married, the folks bought the Jenkins place at 147 Hames Road. There were two and one half acres. When Dad died, Mother sold two acres to Mr. Winterholder. He was going to build a home on the bottom part of the property. He sold the property to Ed Pybrum who developed it for other homes. He cut a road through and named it Brodin Lane. The Corralitos Grange Hall and Brodin Lane development circa 1969. It was depression time in the 1930s and people were having a difficult time finding work and caring for their families. 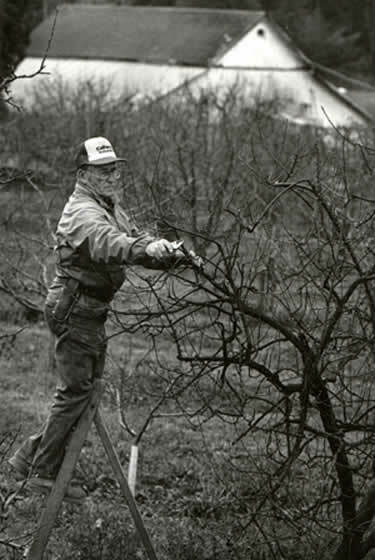 Mr. Ed W. Crow bought acreage in an apricot orchard off of Amesti Road. He sold lots for $1.00 down and $2.00 a month. He named the property Paradise Heights. It didn't retain that name because it was nicknamed Crow's Nest. This is the name that has stayed with the area over the years. "I was born in Pike county, Missouri, January 9, 1856; crossed the plains to California in1857; farmed 50 or 60 years and farming went on the bum so I quit farming and tried the real estate business when Cleveland was president. I had 300 acres of alfalfa, 80 head of horses and mules, 100 head of hogs, 40 or 50 turkeys, 100 chickens, a good stallion, a thoroughbred jack and I came to Watsonville about seventeen years ago with a model T Ford and about $2,000. Since then, I have sold lots to about 60 poor people for $1.00 down and $2.00 a month. On June 14, 1941, I went back to Missouri on the train to see my sister and nephew, Governor Lloyd Crow Stark of Missouri. The governor gave me a nice cane (pearl handled and inscribed) and my sister gave me a new hat and a nice valise. Coming back, I stopped off to see my four boys who have made a barrel of money the last year around the army camps. They told me if I would give my old car to W.T. Crow who runs the vinegar works near Capitola they would give me a late model eight cylinder car, so I drove the new car up from L.A. and gave the old car to my oldest son, Wyman. Now I am out of debt and I have an income of about $80 a month. I am living all alone, keep bachelor's hall, and I feel lonesome at times and if any old maids or widows that have got an income ¼ as much as I have got I would like to get acquainted with them. Ed. W. Crow Rt.5, Box592"
Unfortunately, Mr. Crow died when his two-story house caught fire and burnt down sometime in the early 1940s. According to the newspaper, he was 86 at the time. The house burned to the ground after 10:00 on a Friday night. His remains were taken from the home to Mehl's in Watsonville. Deputy Sheriff Lowell Roundtree gave the information of the fire and death to the newspaper. 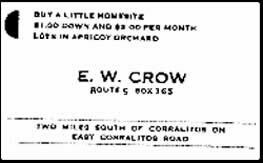 The streets in Mr. Crow's subdivision were named after him and families living there; Crow, Bowen, Hatton, Whiteman, and Velazquez (sic). Mr. Crow's two-story house had been on the right hand side of Varni Road beyond Mattie Dye's Home Grocery Store that was situated on the corner of Varni and Amesti Roads. 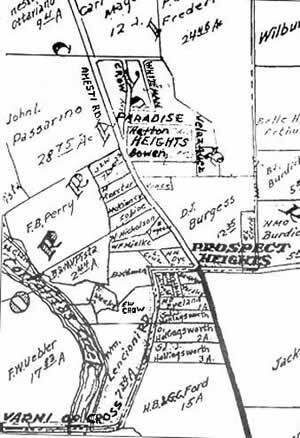 Mr. Crow's name for the subdivision, Paradise Heights, was certainly appropriate for the area. Others came to refer to the area as Crow's Nest, which became a nickname fondly used. For a time, people from other areas referred to the place as "Little Hollywood" in making fun of the many poor people arriving from different places looking for a place to live. This name was used as a derogatory term in the early days of settlement, but did not stick. "Crow's Nest" it was and always shall be, thanks to a generous man having made it possible.